GPS Receiver with fast signal acquisition and 10Hz positioning updates, making it an ideal GPS for pilots, race car drivers and other fast moving applications. 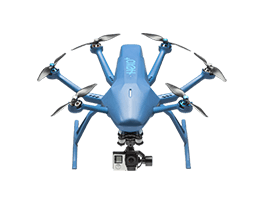 In short, using this GPS (bluetooth-connected to your smartphone) enables you to get a drone 10 times more reactive to your moves, having better framing precision and fluidity. We’ve been extensively testing this product with the Hexo+. This GPS is not for sale on our website. More information on merchant’s official website.